You survived the new ACA Reporting last year, but what do you need to do throughout the year to make sure you are ready for the 2017 reporting? We have come up with a handy “Top 10” list for you to make sure that you will be successful with your reporting and your form 1095-C’s! Does your company offer healthcare benefits to all qualified (full-time and full-time equivalent) employees? If the healthcare benefits qualify as minimum essential coverage under the ACA, make sure all of your employees have the right benefit added in Sage HRMS. If an employee waives coverage (for instance, if they’re covered under a spouse’s healthcare plan and don’t need insurance from your company), you still need to add the benefit to the employee and enter a coverage Date Waived (Employee > Benefits > Insurance Benefits > Benefit Plan tab). This is necessary for My Workforce Analyzer to correctly analyze and report your data. When you have Part Time employees that were Regular Full Time during any part of the year, you will need to keep track of the month(s) that an employee was considered part-time so that the 1095-C form can be edited. In addition this will also impact your full-time Employee Count on line 23 of form 1094C. So how do you keep track of this? Make sure that you are tracking your changes in status with your Employee Type in Job History – specifically anyone that changes from RFT (Regular Full Time) to RPT (Regular Part Time). If you have Part Time employees that receive benefits, the recommendation would be to separate those Employee Types out as well i.e. Part Time with Benefits/Part Time without Benefits so that you can also track those status changes if they happen throughout the year. 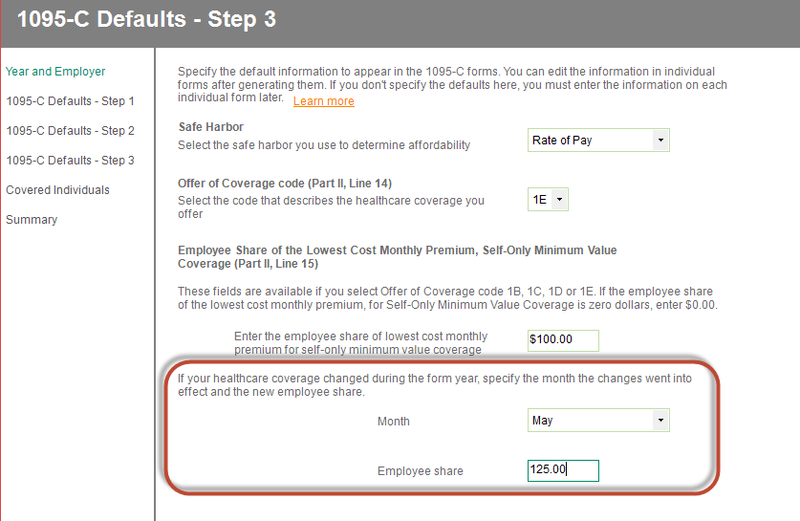 When you make the change in Employee Type, another recommendation would be to add a change reason specifically for ACA reporting. If you have a specific change reason, you can run a report off of that change reason at the end of the year to adjust your 1095-C forms if necessary. You can see the example Reason code below as well as a quick Secure Query that lists the Name, Change Reason Code filtered to “ACA”, Company code, Employee ID, Employee Type, and Job Title. Some other ideas would be to use a custom screen or an Event in Sage HRMS or Abra Suite to track the changes which would also allow you to run a report at the end of the year as you are editing your 1095-C forms. Or, if you just love spreadsheets, that would work too but keeping it separate from HRMS or Abra may cause you issues in the future. This will help you to audit your 1095-C forms to make sure that the dates are correct. In addition, it will help with counts needed on your 1094-C form for full-time employees and total employee counts. Some standard reports in Sage HRMS or Abra Suite would help you with this to include the Terminated Employee Log and the New Hire Log. You could also do a Secure Query to pull in this information and review it throughout the year as needed. If the company does not offer coverage at the beginning of the form year, it will be necessary to keep track of the dates when coverage was offered in order to edit the forms accurately. A good way to look at counts for your 1094-C forms is to run an EEO-1 (or EEO-4 depending on setup) or a Crystal report by month, on the same day of the month every month, to get Full time and Part-Time counts per month. Then keep track of those numbers either by saving the report or recording those numbers on a spreadsheet so that you can input those numbers on your 1094-C form at year end. If a qualified benefit is not based on calendar year (Jan – Dec) it is needed for forms to know the change-over month and amount of Employee Only Share for the new plan. You will have to enter that amount when you process your 1095-C forms for each employer and you can designate if the amount changes throughout the year. What is a Variable Hour Employee? Basically, it’s a new employee that you are unsure about whether they will end up working 30+ hours per week and qualify for benefits or not. Once the employee is identified as variable hour, you have a few months to track the employee’s hours of service (not just hours worked, but also any hours they get paid for like vacation or sick), and then make a decision how the employee should be classified. Let’s look at this example: You own a bakery with a cake delivery service. You get really busy several times each year. This year you decide to hire 10 new delivery drivers in March to handle the extra work for Easter. But you hire them conditionally, based on the amount of cake orders your company receives each day. Some days, the delivery drivers may work only 2 hours, and other days it may be 10 hours. It all depends on the supply and demand. After the holiday has come and gone, you decide to keep some of the drivers because your business is doing really well. Four of the drivers are most likely full-time employees because they usually work close to 40 hours each week. Two of the drivers are most likely going to be part-time because they prefer to work the late shift, and deliveries are usually done by 9 pm, so they usually only work about 20 hours a week. But you need to wait until the fanfare from the publicity dies down before you make a permanent decision. So what do you need to do about these variable hour employees in Sage HRMS or Abra Suite and My Workforce Analyzer? 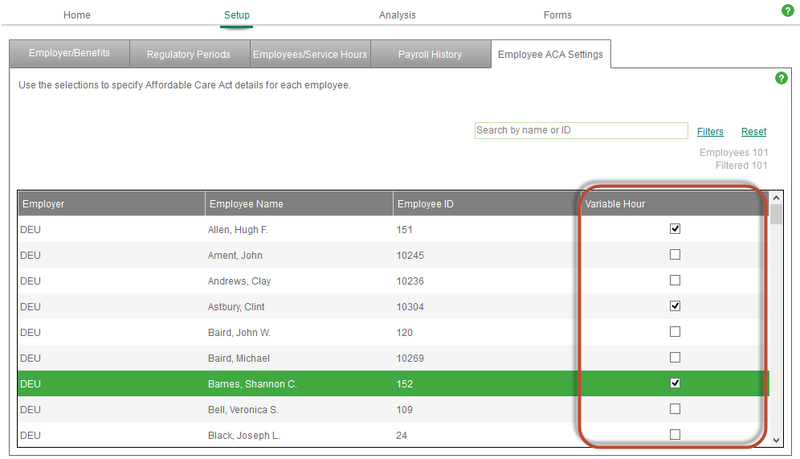 Enter them as employees in Sage HRMS or Abra Suite. There’s no requirement from the ACA to offer these types of employees healthcare benefits just yet. Then in My Workforce Analyzer, be sure to set up how you want to track (measure) your variable hour employees. Do this on the Setup > Regulatory Periods tab in MWA. You will designate how much time you need in order to identify if they are part-time or full-time as the Measurement Duration. Again, this only applies to new hire employees if their status is unclear. This will not pertain to normal Part Time employees! After setting up the variable hour measurement periods, you have to identify who qualifies on the Setup > Employee ACA Settings tab. Check the box next to each employee who is variable hour. Next, you have to keep an eye on these employees. When the measurement period is up, you have a short time to make a decision. Use the Analysis > Variable hour report in My Workforce Analyzer to keep track of their hours and their “assessed” status (what MWA determines their status should be based on their hours of service). You must offer eligible employees healthcare benefits before the Admin End Date. Important! Don’t forget to remove employees from the Variable hour status after that Admin End Date. 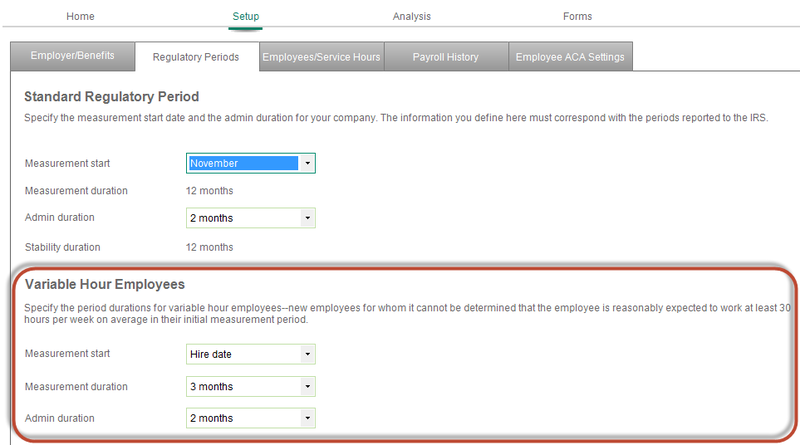 Clear the check box next to each employee who is no longer variable hour on the Setup > Employee ACA Settings tab. 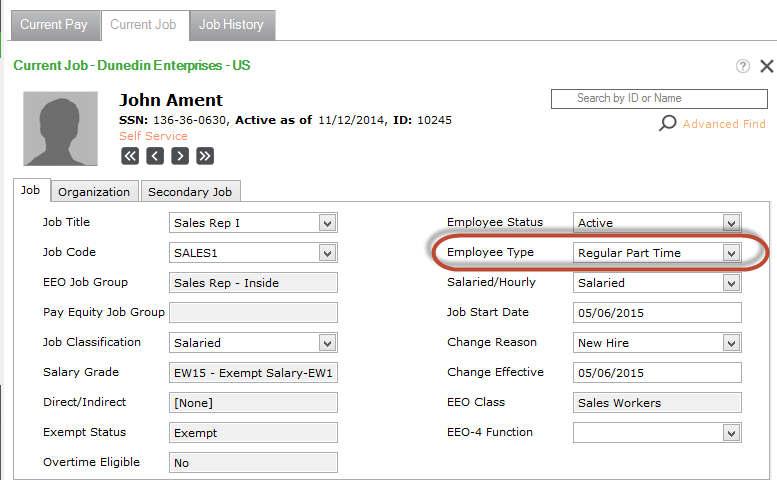 My Workforce Analyzer uses the Employee Type codes from the Job and Pay > Current Job Employee Detail window in Sage HRMS. The best way is to set up your Employee Type codes to match employment statuses like Temp, Full-Time, Volunteer, Intern, Terminated, and so on. You have to map the Employee Type codes from Sage HRMS to a few options in My Workforce Analyzer on the Setup > Employees/Service Hours window. The options for mapping are Full-Time, Part-Time, Seasonal, and Excluded. Whenever you add a new Employee Type code to Sage HRMS, make sure you go into MWA and map that new type to the appropriate option. This is important to make sure My Workforce Analyzer captures all of your employees and assesses them the right way. Maintain covered individuals (dependents) in Sage HRMS or Sage Abra Suite especially if you are Self Funded! Some basic information about your employees’ dependents and beneficiaries must be maintained in Sage HRMS or Sage Abra Suite to prevent more work in My Workforce Analyzer later on. Dependent social security number and/or date of birth. This is needed for the 1094-C forms. Enter it in Sage HRMS on the employee record right away so you don’t have to worry about collecting this info at year end or when you’re preparing the ACA forms. Dependent benefit coverage dates. When you add a new dependent to an employee in Sage HRMS, the system defaults the employee’s effective dates (including the expiration date). Update the dates if they’re different from the employee’s! 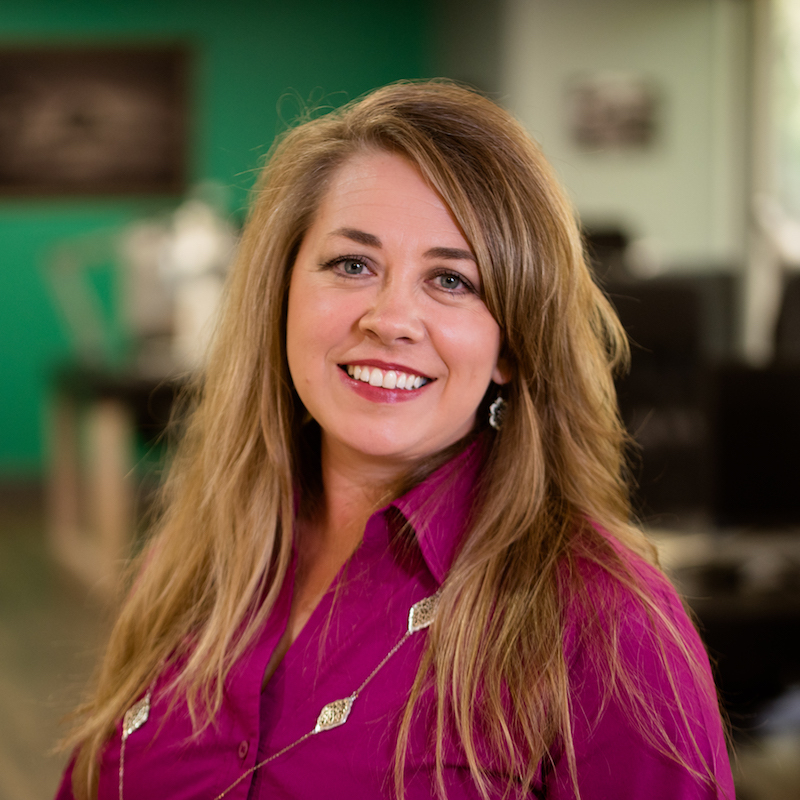 In all of your processes in the Sage HRMS and Sage Abra Suite product – be consistent! All users should be consistent in how they use the processes in the product (examples processes: hire, rehire, termination and benefits). Consider meeting with the users of the product to verify they use it the same way. Terminated employees are terminated using the Terminate Employee process to verify that benefits and end dates are addressed properly. We hope that this will at least get you on track to make your life much easier when you process your ACA forms at the end of the year! As always, if you need assistance or need some further ideas on how to track your records and be consistent, contact CS3 Technology right away!